Cryptic is in dire need of some social media assistance, or at a bare minimum a marketing team that understands it’s own products. A few hours ago images were released of a new class of Starship – the Pathfinder Class. It’s a damn fine-looking ship. I actually want one without even knowing what it’s all about. It’s that good looking. The combination Twitter and Facebook post has triggered a flurry of responses that are overwhelmingly negative. Not so much about the design, but around the ridiculous costs associated with upgrading. 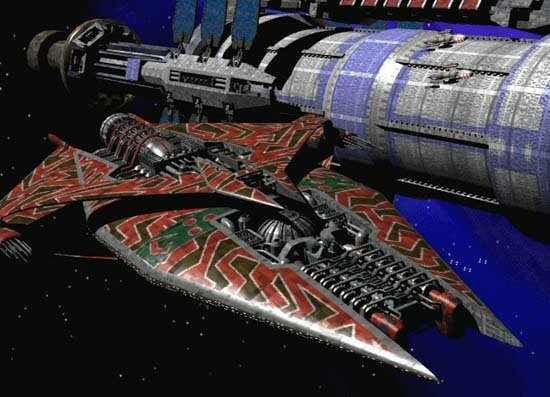 On a completely different note, she reminds me in small ways of this classic ship from Babylon 5 – The Narn Battle Cruiser. I’ve always had a thing for split primary hulls. Now imagine an MMO set in the B5 Universe.. Sigh. I can only dream. Previous Previous post: Thanks to Priority One Podcast for including the DR Costs Infographic. Next Next post: Cryptic’s XP post reads like it was written by Romulans.